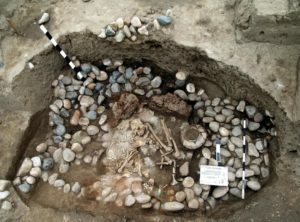 MAX PLANCK INSTITUTE FOR THE SCIENCE OF HUMAN HISTORY—An international research team, coordinated by the Max Planck Institute for the Science of Human History (MPI-SHH) and the Eurasia Department of the German Archaeological Institute (DAI) in Berlin, is the first to carry out systematic genetic investigations in the Caucasus region. The study, published in Nature Communications, is based on analyses of genome-wide data from 45 individuals in the steppe and mountainous areas of the North Caucasus. The skeletal remains, which are between 6,500 and 3,500 years old, show that the groups living throughout the Caucasus region were genetically similar, despite the harsh mountain terrain, but that there was a sharp genetic boundary to the adjacent steppe areas in the north.